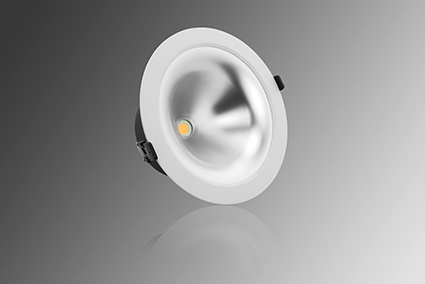 Verbatim announced the launch of an anti-glare downlight with high efficacy and lumen output and a beautiful light distribution for use in areas including offices, conference rooms, retail spaces, foyers, corridors, hotels or restaurants. SD cards are used in a wide range of devices – digital cameras, smartphones, laptop computers, tablets, game consoles, 3D printers, drones, and many more. However, they come in various sizes, types, capacities, transfer speeds and prices, which can make it tricky to buy the correct one. Here is a quick guide from Verbatim to help you pick the right SD card! Verbatim today announced the launch of PRIMALLOY® BLACK, a high performance filament for material extrusion to enable designers to create 3D functioning objects where flexibility and durability are the key components. Applications for PRIMALLOY will come from the automotive, home and industrial sectors and will include items such as door latches, electrical connector boots, hand grips, seals, gaskets, plugs, robot parts and protective applications. Freecom has launched the mDock range of high quality hard drive docking stations to provide easy access files on 2.5” and 3.5” internal hard drives. The new mDocks from Freecom include a choice of interfaces and are housed in compact and tough metal enclosures, matching the attractive range of Freecom metal 2.5” and 3.5” hard drives. Verbatim has launched an elegantly designed flicker-free LED ceiling light with a perfectly even light-emitting surface and indirect corona effect. Its long lifetime (50,000 hrs, L70), excellent luminous efficacy, narrow binning and IP40 rating, which prevents ingress of insects and dust, make it an ideal general lighting solution to replace conventional fluorescent technology. Verbatim is also offering an anti-glare microprismatic version designed specifically for office applications as well as a DALI dimmable option. A special feature of the new Verbatim ceiling light is its optional indirect corona or halo effect that makes the luminaire appear to “float” on the ceiling, smoothing the contrast between the light-emitting surface and the background or ceiling it is installed onto. Conveniently, the corona effect can be added or removed at will by applying the covering magnetic clip system that is provided with the luminaire. The ceiling light can also be suspended to create an elegant lighting feature. 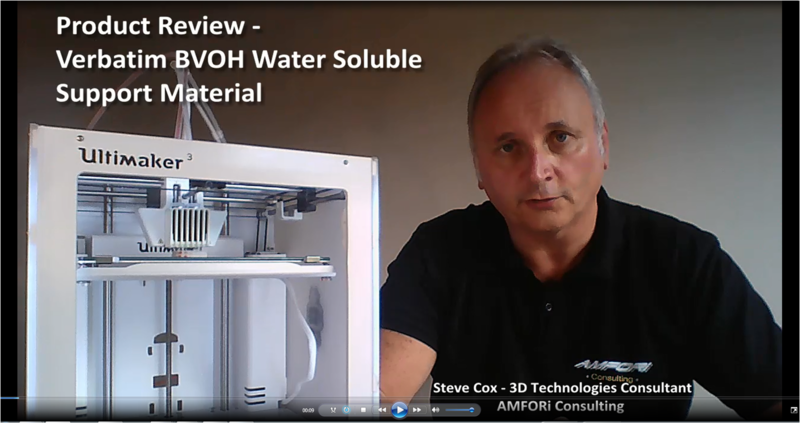 Verbatim, part of the Mitsubishi Chemical Holdings Group, has launched a high performance water soluble support material, Butenediol Vinyl Alcohol Co-polymer (BVOH), for quick and successful printing of complex objects with overhangs using dual extrusion 3D printers. Verbatim’s BVOH is an easy to print material with reliable extrusion properties and a quick dissolve time, much faster than current PVA / PVOH materials in the market, allowing designers to realize their 3D models far quicker than before. Falcon Technologies International and Verbatim sign exclusive Distribution Agreement for the Middle Eastern region. Optical Media storage specialist Falcon Technologies International (FTI) has announced the signing of an exclusive agreement with Verbatim, the storage media giant owned by Mitsubishi Chemical Media, to distribute Verbatim products in the countries of Bahrain, Iraq, Lebanon, Kuwait, Oman, Qatar, Saudi Arabia, and the United Arab Emirates. This agreement comes after several years of mutual collaboration between the two companies, and allows FTI to distribute the full range of Verbatim products as well as products from Freecom, a brand also owned by Mitsubishi Chemical Media that specialises in high-end external SSDs and hard drives. The deal was finalized and signed during the recent FTI Customer Seminar 2017, which was hosted in Ras Al Khaimah (UAE) on April 4th and 5th and attended by many leading players within the global optical media industry. 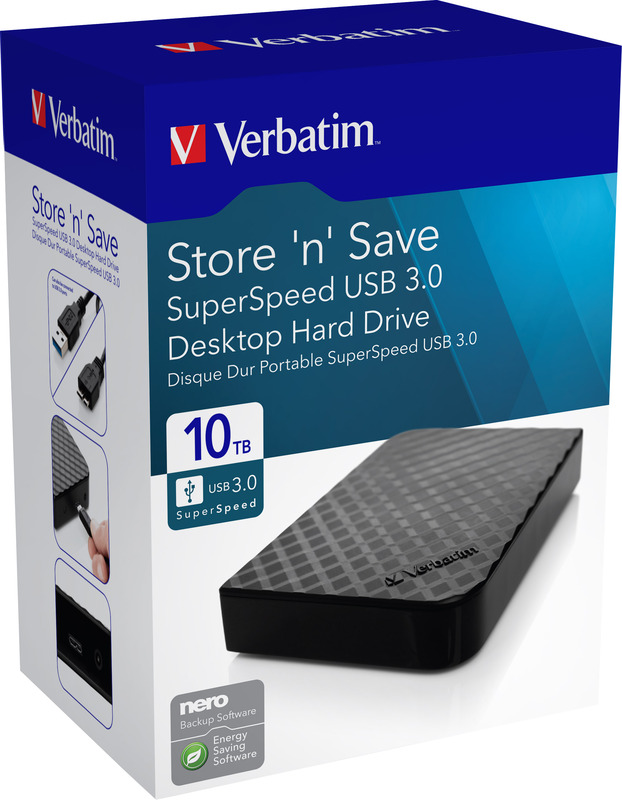 In response to ever-increasing creation of data and thirst for storage, Verbatim announces its highest capacity desktop and mobile hard drives to date – the Store 'n' Save USB 3.0 10TB Desktop and the Store’n’Go 5TB Portable Hard Drive. The new devices are styled with a smart woven pattern and are available to buy in Europe with a manufacturer’s warranty of two years. Creating a backup refers to making a ‘copy’ of the data (e.g. images, videos, important documents) or ideally two copies, and keeping both copies in case something happens to the original. Transferring your holiday or wedding pictures from your camera to your memory card or hard drive to free up space in your camera is not backing up – the idea of a backup is to have spare copies saved on other storage devices in case something happens to the master files. Verbatim, which is part of the Mitsubishi Chemical Holdings Group, announces its latest 3D material – Polypropylene (PP) – offering high levels of chemical, heat and fatigue resistance and good hinge properties. Manufactured in Japan, Verbatim’s new PP filament will give users opportunities to make 3D printed prototypes and products for the automotive, pharmaceutical and toy industries, and particularly where the objects are exposed to chemically affected environments. When extruded, the Verbatim PP material provides good mechanical properties of stiffness and tensile strength and delivers a smooth surface finish.